Production: Too much or too little? You’re a one or two man shop; you’re doing pretty well with orders. You’re making ok money – but you want to up it a notch, because business is picking up – due to word of mouth, and advertisement you’ve been doing. The problem? Production. Specifically, how much to do. What’s the right rate? If you’re making, for instance, mantle clocks, do you make enough for that day, a couple of days – or a huge run of, say, twenty? They all have their good and bad points – but one is better then another….. 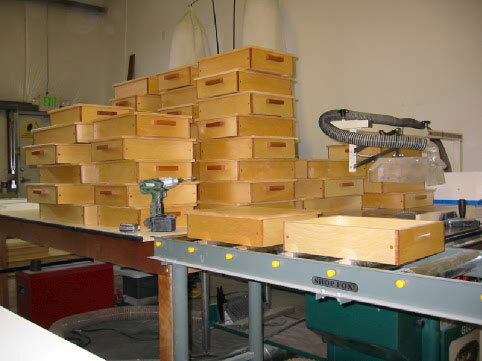 There is efficiency in bigger runs; it makes more sense to set up a jig once for a complicated cut, and then cut 20 pieces, instead of setting up the same jig 20 times – and risk not cutting them all the same. However, what if you do cut them all at 5″ and 6 degrees, and oops, it was suppose to be 6″ and 5 degrees? No fixing that one – like the barber says, “I can take more off, but I can’t but it back on”. You’ve wasted time and money. On the other hand, if you go slow and cautiously, you’ll be inefficient – and still might make mistakes. Then there is another problem – what if your parts supplier (in this case, maybe the clock movement) screws up – either the parts came and are wrong, of they come days later then you expected? Now your’e sitting on a dozen half-done clocks. Make a little, or make a lot, each has it problems. The answer lies in the middle, of course. Make four or six in a run. That way, if you do screw up, or you supplier messes you up, you’re not siting on a bunch of junk, or half-done inventory. You can put them away, and start on something else until the problem can be fixed. You can be both efficient and cautious.